On Monday 18 February, work began on the final stage of the £1.2m Flood Prevention Scheme at the Leggate in New Cumnock. the final part of this project involves the adjustment of the profile of the B741 carriageway that will complement the flood prevention work carried out to date. Due to the extensive nature of the works, to road was scheduled to remain closed for a period of six weeks. After the works began, Transerve notified the Ayrshire Roads Alliance that the A76 would require a full closure on Monday 25 and Tuesday 26 March from 18:00 to 06:00 both days. This closure would have a serious effect on the community of New Cumnock and stopped access to the village from the North and the West. Following discussions with Transerve, the Alliance has agreed to open the B741 under traffic lights on Monday 25 March and Tuesday 26 March from 18:00 to 06:00 both days, ensuring that access is maintained to New Cumnock. This will cause some delay to the works on the B741 and while this is regrettable, it is considered the best course of action for the local community. The final part to complete works on Phase 1 of the New Cumnock Flood Scheme is to re-profile the section of the B741 to Knockshinnock road. This ensures the diverted waters from the Connel burn follow the intended route away from properties and safely to return to the watercourse downstream. These works which require complete replacement of sections of the road and new vertical alignment of the length, (and associated bridge works) are scheduled to commence on the 18th of February and last for 6 weeks , (subject to weather) this will require the closure of this section of road and a diversion to be put in place via the Boig Road towards Cumnock and back to New Cumnock. Vehicular access for residents/owners/occupiers within the closure will be permitted to and from their properties but not through the actual works site. Access for the emergency services and pedestrians will be maintained throughout the closure period. Alternative Route: via B741, A76, A70, B7046, U743 Newfield and C 36 Boig Rd and vice versa. On the 22nd January 2019 East Ayrshire Council implemented an order which imposes a variable speed limit on the lengths of roads listed below. The speed limit will only come into effect when speed limit signs denoting the reduced speed limit are displayed on the affected length of road, on the grounds of road works being or are proposed to be executed on or near that road. No person shall drive a motor vehicle on any affected length of road at a speed exceeding that denoted by the temporary speed limit signs displayed in accordance with Diagram 670. The Order is in force from 00:01 hrs on 24/01/19 and will remain in operation until 24:00 hrs on 03/01/20. The Order will be implemented only when appropriate signs are displayed. A70 From the South Ayrshire boundary eastwards to the South Lanarkshire boundary. A713 From the South Ayrshire boundary southwards to the Dumfries and Galloway boundary. A759 From the South Ayrshire boundary eastwards to its junction with A735 John Finnie Street, Kilmarnock. B751 From its junction with the A77 south-westwards to Gatehead. East Ayrshire Council has awarded RJ McLeod (Contractors) Ltd. a contract to carry out a major road realignment on the A70 at Glenbuck near the East Ayrshire/South Lanarkshire boundary. The Works involve some 800m of road realignment and replacement of the bridge carrying the road over the River Ayr. Works commenced on 30 July 2018 and are expected to be completed in May 2019. Traffic management will be in place during the works and delays are possible. A recent road closure at Glenbuck has allowed the River Ayr culvert to be replaced and a further road closure will also be required to facilitate final carriageway surfacing work towards the end of the contract. Further information will be provided in advance of this closure which will have a signed diversion route. The Ayrshire Roads Alliance thank you for your consideration and patience whilst these road improvement works are undertaken. The Ayrshire Roads Alliance Gritting Tracking provides details of current winter service vehicles operating in East and South Ayrshire. 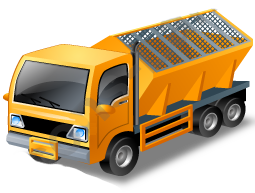 Please click on the link to view the Gritter Tracking Map.